An injury time header from substitute Mark Davison saw Morpeth Town end South Shields 32-game winning streak with a 1-1 draw at Mariners Park on Saturday afternoon. 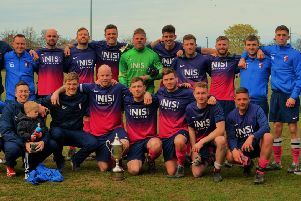 The hosts, who would have secured the EBAC Northern League Division One title with a victory, took a 3rd minute lead through former Gateshead striker Carl Finnigan. But Davison’s 91st minute equaliser from a Sean Taylor corner means Town still have a slim chance of overtaking the FA Vase finalists. In front of a mammoth crowd of 2054, the second largest in the Northern League this season, Morpeth gave the hosts a guard of honour for their achievements in the 2016/17 season. And a mere 3 minutes into proceedings the Mariners took the lead, Jon Shaw nodding down a Wayne Phillips free-kick for Finnigan to sweep home into the bottom left hand corner. Four minutes later, Ex-Professional Julio Arca tried his luck from long range but his effort went well wide of Dryden’s goal. The wind was causing havoc throughout the game, and made it difficult for either side to create any noteworthy opportunities, especially in the first period. As the game approached the half hour mark, the hosts went close to doubling their lead. A long ball from Liam Connell picked out Gavin Cogdon who took the ball in stride and scampered towards goal. Cogdon, who had netted four times in three appearances against Town this season, took the ball past Dryden before setting himself to strike goalwards, the delay allowed Chris Reid to get in the way of the effort and head the ball away. Another chance fell to the Mariners in the 36th minute, Wayne Phillips the beneficiary latching onto a cross at the back post, but his strike rippled the outside side netting. Two minutes into first half injury time, the visitors created their first chance, Ben Sayer’s right wing corner headed across goal by Jordan Fry, Liam Henderson unable to manoeuvre himself into a position finish. The opening seconds of the second period caused more problems for Morpeth, Cogdon striking just wide of the target after 18 seconds. At the other end, Henderson tried his look from an acute angle but the effort flew well wide of Connell’s goal. Ben Sayer went close direct from a corner as Connell was forced to claim under his own crossbar, the wind still effecting the game. As the clock ticked past the hour mark, the Highwaymen were awarded a free-kick 22 yards out. Captain Keith Graydon stepped up before curling and effort just wide of the top left hand corner, Connell left stranded. Two minutes later Connell produced a fantastic save as Henderson’s looping header was dipping just under the crossbar. Morpeth’s spell of pressure nearly told soon after, substitute Davison heading the ball into the path of Joe Walton who fizzed a half volley well over the bar. South Shields were a threat on the counter, Arca slicing the Morpeth backline with a delightful through ball, Finnigan hitting the target denied by the feet of Dryden. With 10 minutes, remaining Cogdon should have put the game to bed, he found himself in front of an open goal in the 18-yard box, but sliced an effort wide. A long-range effort from Robert Briggs flew just over the bar before the last gasp equaliser saw the Highwaymen extended the title race by three days. The Highwaymen now must win their three remaining games with South Shields failing to win both of their games against Ashington and Guisborough Town. The Mariners could wrap up the title against our Wansbeck rivals as early as Tuesday evening.